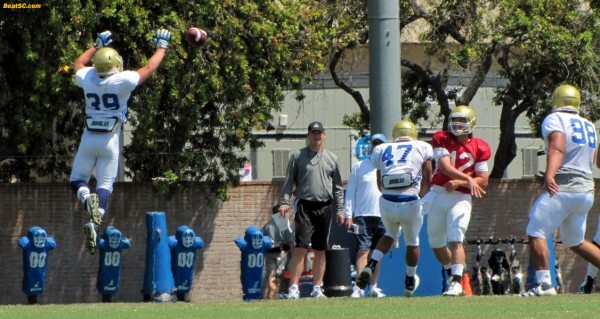 Three big Interceptions during UCLA’s Spring Practice scrimmage gave fans flashbacks of the last several years of Bruin Football — Just not enough talent and execution from the signal caller, resulting in Turnovers and missed opportunities. However — These three INT’s were the EXCEPTION, not the RULE. Most of the passes were safe, as the Bruin Running Backs continue to sprint to the sidelines and receive passes that enable them to turn the corner with a head of steam. Steven Manfro caught two balls like this that he took to the house. Once Manfro finds an opening, he sprints down the edge of the field, not stopping until it’s time to spike the ball in celebration. The other Running Backs, including Jonathan Franklin and Dalton Hilliard, can also make things happen with the ball. 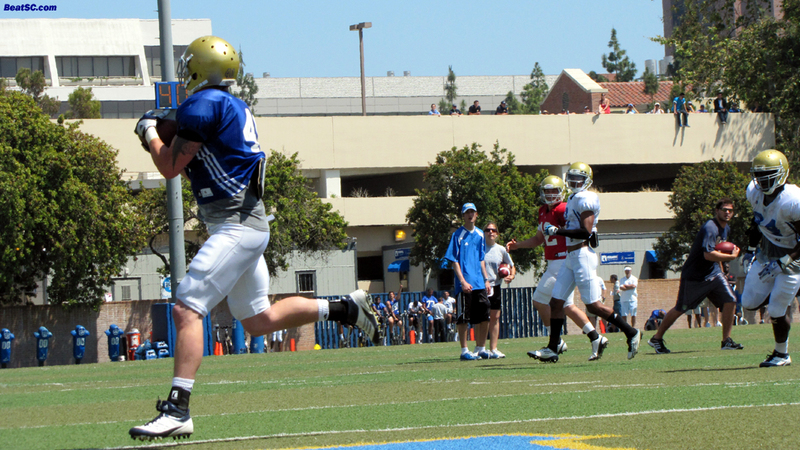 And it’s not just the Tailbacks getting involved in the passing game — When the Bruins were close to the Goalline, twice they found Fullback David Allen slipping unnoticed into the end zone to make wide-open Touchdown grabs. And the Bruins won’t be all-pass/no-run. They showed a few diferent run plays, most of which had the Quarterback faking as if he were keeping the ball for a QB Run. 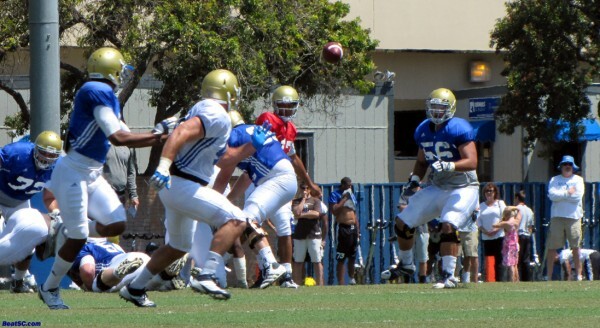 For the most part, the UCLA Defense wasn’t fooled, but there were some holes that opened up, and the RB’s showed some nifty moves to take advantage of the running lanes. In summary, there is plenty to be excited about with the new Bruin Offense, but it is sooo early — Any observations I make — in April — really mean ZEPPO. 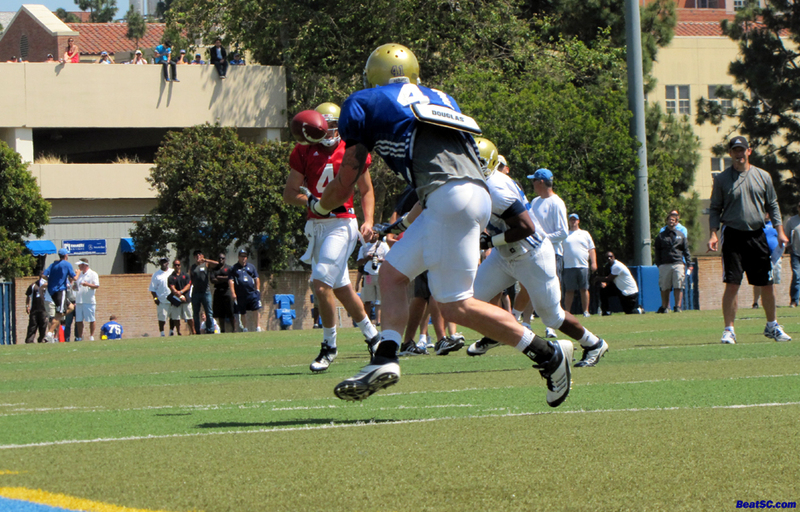 Below are 8 photos from Saturday’s scrimmage — Click on them to enlarge them. … and here’s another one. "HUR-RY FOR CAPTAIN SPAULDING" was published on April 22nd, 2012 and is listed in Blue & Gold News, UCLA/usc/Sports Photos.